Beginning in the late 1990s I found myself writing a series of songs about people and events in Arkansas’ colorful history. 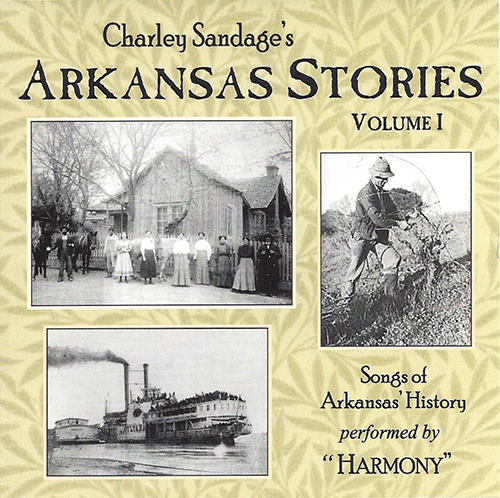 Over the years, the Arkansas Stories Project has generated concerts, school curricula, children’s books, and public radio and TV programming, but it all began with the songs. The performers are a Mountain View trio known as “Harmony,” Mary and Robert Gillihan and Dave Smith. Among them they play a wide range of traditional instruments, and they are masters of the art of telling stories in songs. We didn’t know that Arkansas Stories Volume I would be Volume I when we recorded it in 1999, since we had no idea other recordings would follow. Dan Brackin engineered the project in Dave Campbell’s nearby Blue Mountain Studio, which is no longer operating. The stories in the songs range from Arkansas’ branch of the prehistoric Caddo Confederation to the big flood of 1927.